The Fast and Easy Way to Fill Your Tires ! Air compressors at the gas station are expensive and driving on tires with low air is dangerous. Air Dragon is the better way to inflate everything! Just plug it into any 12-volt outlet. 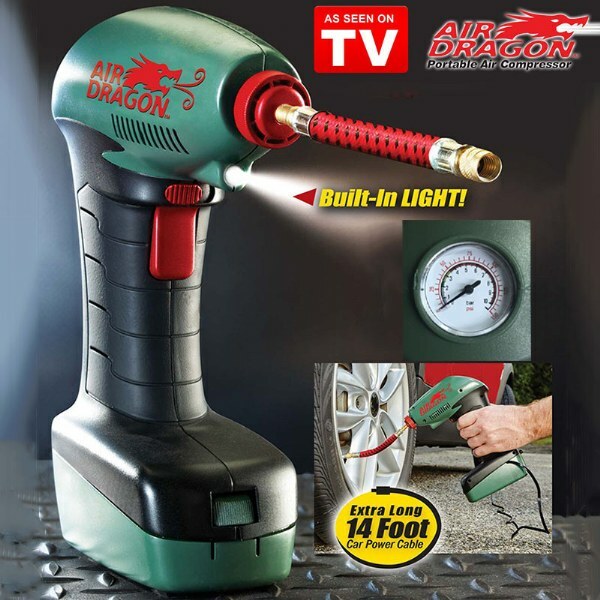 Air Dragon harnesses the power from your vehicle to quickly and efficiently fill your tire with air. In just seconds Air Dragon can get you safely back on the road! The power is in the piston compressing the air faster and stronger so you can get the job done. Using Air Dragon is so easy. Set the PSI on the digital display, then pull the trigger. Air Dragon stops automatically, giving you the right amount of air for a safer ride. This powerful air compressor includes multiple adapters so you can fill anything, any time. Its compact design is perfect for keeping around the house for air mattresses, bicycles, and sports balls, or in the car for a quick tire fill on the road! Air Dragon&apos;s hard shell casing makes it tough so mechanics trust it and you won&apos;t bust it. Get the perfect PSI with Air Dragon.